Chandigarh - Regional Centre for Entrepreneurship Development (RCED) conducted a Faculty Development Programme (FDP) on behalf of the Department of Science and Technology (DST), Entrepreneurship Development Institute of India (EDII), in active association of Chandigarh Group of Colleges, Landran. The two-week programme concluded today. FDP aims at equipping teachers with knowledge and skills that are essential for inculcating entrepreneurial values in students and guiding and monitoring their progress towards entrepreneurial career. Through this FDP, 34 faculty members of different colleges and university in the field of entrepreneurship were trained. Prof. PN Hricheekesha was the chief guest of the valedictory function, which was also attended by Dr. Rajdeep Singh, Director, CEC, Landran, Prof Manish Mahajan, HOD, CSE, Paramjit Singh, Director, RCED and Balbir Singh, Advisor, RCED. The memorandum of understanding (MoU) was signed between RCED and CGC Landran. 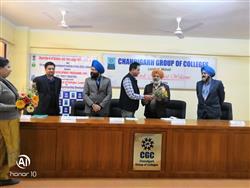 The objective of the MoU is to conduct Skill and Entrepreneurship Development activities in the campus, where CGC Landran will provide infrastructure facilities and potential students for above said activities and RCED Chandigarh will provide all types of professional inputs including senior faculties. The speakers and industry experts who interacted with the participants also included: Dr. Bharat, Punjab University, Dr. Geeta Mehra, MCM DAV College, Gursharan Singh, Director, True Success, Sandeep Kumar, PCS, Employment Exchange, PN Khanna, LDM, PNB, Neeraj Sharma, Director, ACME Marketing, Ravneet Kaur, SGGS College of Pharmacy, JS Sahota, Ex GM, Indian Oil, Tarun Preet Singh, Prof. Nirmal Datt and Satvinder Singh from RCED.